The name lucky bamboo is a misnomer in that the plant is not a bamboo at all. The lucky bamboo is in fact the Dracaena plant - a plant that finds favor with most Feng shui followers. Believed to be the harbinger of good luck, the lucky bamboo plant or Dracaena Sanderia is a wonderful blend of the wood and water element. Found in the dark tropical rainforests of Southeast Asia, the lucky bamboo plant grows best in indirect sunlight. Lucky Bamboo is known as 'Fu Gui Zhu' in Chinese. Fu indicates rich, gui noble and zhu bamboo. 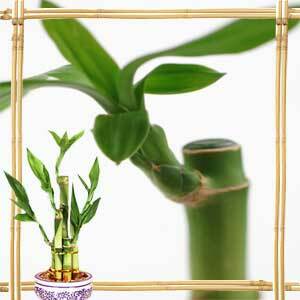 A lucky bamboo plant helps in balancing a pointed corner of a house or an environment that is severely yin in nature. This plant is often placed in the wealth area of the home or office to stimulate stagnant chi. Lucky bamboo plants with curled stalks are expensive. A lucky bamboo plant with 2 stalks signifies love while 3 or 6 are a harbinger of happiness. If your lucky bamboo sports 5 or 7 stalks, it is indicative of good health while 9 stalks are symbolic of overall good fortune. The most powerful is the one with 21 stalks. This plant is said to bring in abundant health and wealth. Typically most lucky bamboo plant arrangements are grown hydroponically. Pick a plant that has bright green and healthy leaves. You can grow your own lucky bamboo plant. Take a stalk from a larger plant and place it in a bowl of clean water. Add a few pebbles or colorful marbles to add a decorative touch and also to provide support to the tender stalks. Tying the stalks of the lucky bamboo plant with a red ribbon is said to enhance its overall good effect. Too much sunlight can turn the leaves yellow. The tips of the leaves of the lucky bamboo are susceptible to burning if the humidity is too low. The low-maintenance feature of this plant is another reason for its popularity. It is hardy and needs nearly no natural light or excessive tending. The bamboo plant is not very expensive and takes little space anywhere, be it your desk or the porch. Placement of the lucky bamboo plant for Feng shui is very important. When placed in the East, the plant helps attract good health for the family. Placing the lucky bamboo in the Southeast attracts money and wealth. Avoid any clutter or dirt around the plant. If you want to place your lucky bamboo plant in soil, ensure that the soil is moderately moist. The soil must provide good drainage. Mist the leaves every few days. For those who have pets at home, be aware that this plant can be poisonous to them. Placing your bamboo plant on a high shelf or desk might be better. Do not place your plant directly in front of the air conditioning or heating vent. You can use this plant to activate any stagnant chi area of the house. You can place the lucky bamboo to add yang energy to an area. Ward off sharp corners with the healing touch of a lucky bamboo. The bamboo is considered lucky since it is resilient and symbolic of growth and strength. It does not need not too much tending. If your lucky bamboo plant has grown larger than the container it has been placed in, maybe it is time to move it to a larger pot or loose soil in your garden. But do not go in for too large a pot since the lucky bamboo thrives in a crowded environment. Use soil that is sandy to provide drainage lest it rot the roots of the lucky bamboo plant. Keep the soil moist. Do not water the bamboo plant too much nor allow the soil to dry out. Change the water in which the lucky bamboo plant is placed once a week. You can choose to provide the plant with small amount of fertilizer. Aquarium plant food would do well for the lucky bamboo. Watering your lucky bamboo with bottled water may help since fluoride or chlorine in the water can be detrimental to its growth. Do not place the lucky bamboo plant in direct sunlight. Yellow leaves on the bamboo plant indicates too much fertilizer. Remove them and change the water. Lack of sufficient light causes the leaves to lose color and inhibits growth. First Published Date: 17 Apr 2006 Last modified Date: April 23 2019 This page may have been updated recently as new information is available or the content may have been edited for better readability.